Why do people want us to have a larger clan? Because people panic whenever their clans aren't in the quadruple digits, I guess. Normally population growth alone would have given us ~900-1000 people by now, but so many keep dying that it couldn't keep up. I normally wouldn't actively worry about population until it dips below 720 or so(or unless there are significantly more children than farmers), hence why I haven't been sending out a massive recruitment drive every time I notice that we're still in triple-digit population. 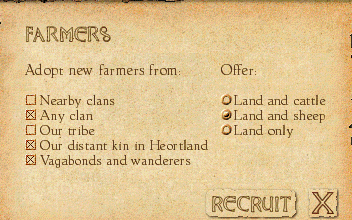 The game gives you a lot of leeway with this stuff; your clan isn't going to shrivel up and die just because you don't have a thousand-strong magic viking horde to grind everyone who's not in your tribe into a fine paste. I do this without voting because voting over crop allocation is boring as hell. Okay loverboy, we tried being nice. Marry her or else. Surely this will never come back to haunt us. I finally have a chance to look at our nobles, and notice two things. Penterest got a new portrait! He's still plenty young enough to see the endgame through, so don't worry. This the only woman noble below age 45. There are actually only three other female nobles - Dorasa(who's already on the ring), a 48-year-old, and a 53-year-old; to add insult to injury, all of them are Ernalda worshippers. If only we hadn't sent Brenna off to die at the hands of/become queen of the dwarfs all those years ago. I do a recruitment drive so goons stop panicking about population already. 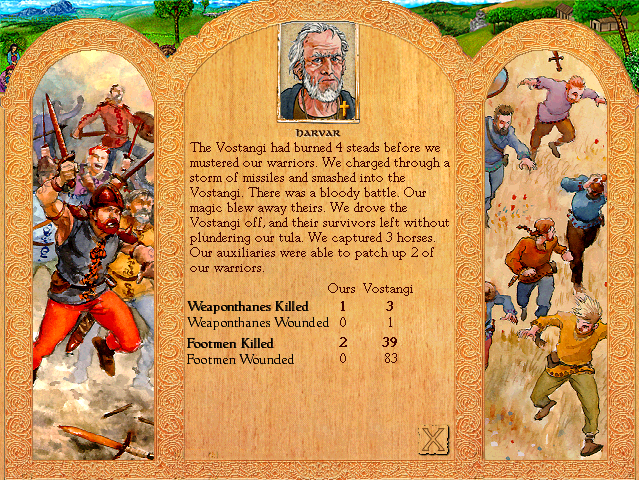 Then the Vostang come along to burn us to cinders, but we win. 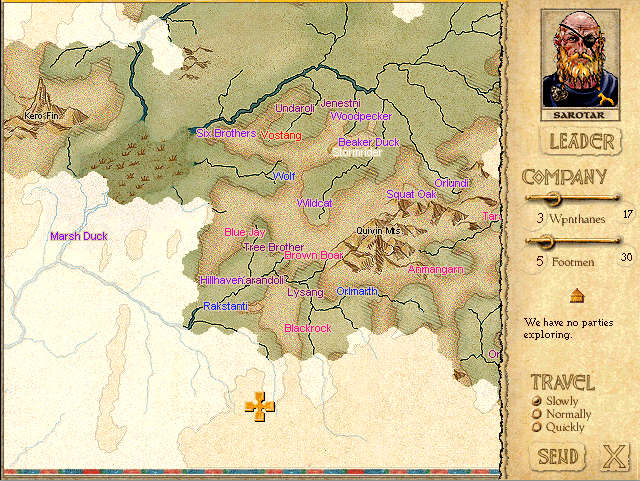 Sarotar the Unlucky gets to go exploring. I noticed in his stats that he's 69 years old. He's looking pretty sharp for a guy that old, aside from missing an eye. 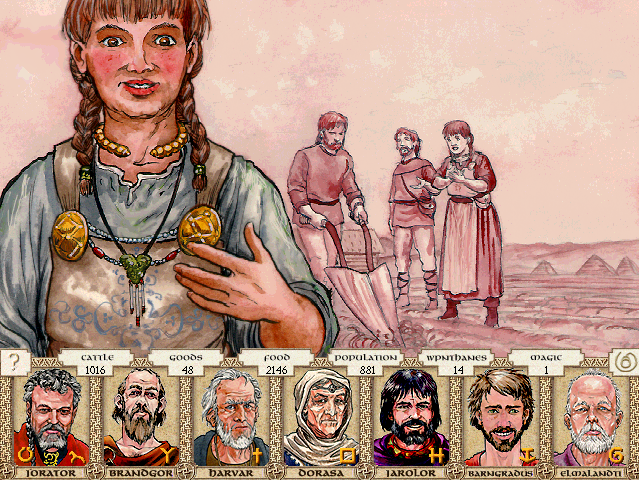 In other news, this is apparently the year the Orlmarthi marry every goddamned person in our clan. 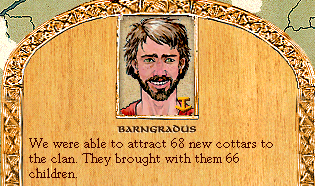 Rangoron, a fine young weaponthane of your clan, wishes to marry Ostlana of the Orlmarth clan. Ostlana's mother, Veoslina, has been given permission by her clan to dispose of any marriage suits. She wants Rangoron to steal the magical plow of the Orlundi and give it to the Orlmarthi. -Allow Rangoron to try to steal the plow. 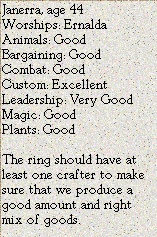 -Ask Ostlana's ring to reconsider the terms of marriage. -Help Rangoron steal the plow. -Warn the Orlundi that the Orlmarthi covet their plow. -"Rangoron, you must not court the daughter of a treacherous person." If we refuse Rangoron, we risk dissention in the ranks. If Rangoron steals the plow, we risk a feud with the Orlundi. If Rangoron steals the plow, they will launch a claim against us at the moot. The Orlmarthi are prosperous; the marriage would be advantageous. We can convince the Orlmarthi to set aside Veoslina's requirement. The Orlundi are well-known for their fertility magic. We should curry their favor. Orlanth performed many great deeds to win the love of Ernalda.